The Wellesley Wine Press: Top 17 Bobby Parkerchuk tweets: Who's behind the account? Top 17 Bobby Parkerchuk tweets: Who's behind the account? I've been enjoying the tweets from Bobby Parkerchuk (@bparkerchuk) since they debuted on Twitter a few months ago. 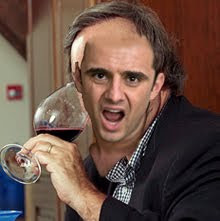 They brilliantly weave the personality of wine industry stalwarts Gary Vaynerchuk and Robert Parker (themselves each on Twitter as @garyvee and @RobertMParkerJr). The mash-up itself riffs off @RuthBourdain but the brilliant thing about each speaks to the brilliance of Twitter. That is, to connect with folks who have the same hyper-specific interests you do. In this case it's an awareness of wine, social media, wine retailing, and specific personalities that come together to create hilarious stuff appreciated only by those who know the characters. "..just had a bourgogne rouge..delicious for the region...84* points...perfect for deglazing pans...3 pak on cindy l8r!" Funny because: of the derision shown for entry-level Burgundy. "back atcha bro! mag of Barroche Pure 07 4 u! RT @JamesSuckling: @bparkerchuk Nothing better than wine and humor. You are 100 points my man!" Funny because: Parkerchuk specifically identifies a wine Suckling rated 96 points while interacting with perhaps the 2nd most powerful Bordeaux taster. "Decoder...when I say I luv something, it's not always true...I can't believe my effing agent booked me in Omaha...hard 2 find #CdP07 there.."
Funny because: it riffs off excessively false positivity from @garyvee while painting a picture of a tortured Parker in Omaha who can't find his beloved CdP. "...u want to talk to chuk? PAR*KER*CHUK... @bparkerchuk me...i never check DM's...i luv u all!" Funny because: it takes the time to notice the mantra on @garyvee's Twitter page mentioning, strangely, that he never checks DMs (direct messages). This is strange because Twitter only allows you to direct message people you choose to follow and if you don't want to receive direct messages from people why are you following them? "Stumentous car..full-throttle, completely hedonistic..96+... @ajv wanted to drive but was 2 busy texting...kids these days..pleasure haters"
Funny because: @ajv is @garyvee's brother and the tweet weaves in Parker's grumpy-old-man distaste for youngsters with familial awareness. "Outstanding night last night...woke up on couch next to DrBigJ..he was saying "those aren't pillows! "...#CdP07 #magnum #thunder"
Funny because: it paints a pictures of frat-house-like debauchery at Wine Advocate headquarters (while staying in character and mentioning #thunder). "@Kisthart u know it bro! i'll have to send DrBigJ to yer place next time he's in tampa instead of Bern's! how R u for #CdP07 & large format?" Funny because: it riffs off Jay Miller's hedonistic jaunts to the legendary steakhouse with those in the wine trade that landed him and the Wine Advocate in hot water because it conflicted with the Wine Advocate's standards of distancing themselves from the trade. "If u watch Lost or Dancing w the effing stars, u are a loser...53 pts...but tune in 4 the newest Winery Advocate TV on iTunes & Spirit Air!" Funny because: it brilliantly plays off the contradiction of discouraging people to hustle and stop watching garbage TV but encouraging them to take time to watch Wine Library TV and pay attention to promos related to Virgin Atlantic Airlines and Gary's recent alliance therein. "the wine critic must always pay his own way...but the bid-nessman who luvs the hustle gets others to pay...#BDX09 #JETS"
Funny because: It pinpoints the contradiction both between Vaynerchuk and Parker as well as the tightrope Gary walks as a wine-rating retailer. "..only buy "futures" from established merchants w a history of buying and delivering wine futures...like Winery Advocate Library! Buy! Buy!" Funny because: More of the same as in the previous tweet. "loving the korean peninsula...that guy to the north really knows how to run a country like a good web forum! Go JETS!" Funny because: it shows timely awareness of the shutting down of the eRoberParker.com forums except for subscribers. "Was invited to do keynote at #140 conference next year...will only do it if crowd has tweets locked for subcribers only..luv u all!" Funny because: Similar to prior showing the contrast between Parker and Vaynerchuk in terms of forward thinking web savvy. "good morning Worcester MA! luv u all! 95 pts...but since we can't ship to u, we luvs u not so much... #notcrushingit #missingCdP07"
Hilarious because (as a Massachusetts guy): it shows an awareness of MA wine shipping laws. "I assiduously avoid being wined and dined by chateaux in Bordeaux..unlike every other journalist and trader..just ask DrBigJ..luv u bro"
Funny because: it plays of Jay Miller's/Wine Advocate's controversies related to getting cozy with the trade when they're supposedly independent and therefore impartial. "Everyone's hanging it up...sad that hosemaster did...always ripped those blobbers a new one.. http://bit.ly/cGbgqy keep on crushing it bro!" Funny because: it gives us a first hint at the real identify behind @bparkerchuk. The Hosemaster hinted at hanging it up but has come back strong. "Bordeaux 2009s are towering, monumental, hedonistic...Drink between 2060-2090...If you disagree, your opinion is false..Trust ur own palate!" Funny because: it plays off the opinion-stated-as-fact of Parker vs. the trust-your-own-palate of Vaynerchuk. "I just became the mayor of Chateauneuf du Pape on @foursquare! #CdP07"
The best tweet ever because: it blends the @garyvee love of social media (we know he prefers Gowalla to Four Square but anyway) with Parker's love of Chateauneuf-du-Pape. So who is behind these tweets? I have a hunch. I think it's Ron Washam from HoseMaster of Wine. Why? I have no idea who the guys is, but his satirical approach to skewering wine bloggers is so successful because he's clearly aware of the nuances of the wine trade, and he's not afraid to ruffle some feathers. Oh, and he's smart too. Bring this all together with his background in the restaurant business (which indicates a potential familiarity with @RuthBordain) and @bparkerchuk is the perfect comic destination for his presence on Twitter. If Parkerchuk stays in character for the episode it has the potential to be hilarious. I know I'll be watching. So here's the office pool: Who do you think is behind the @bparkerchuk tweets? Leave a comment below and we'll see if we have a winner.